Riley’s House Washing is one of the most trusted house washing companies in Pensacola, FL area. For over 25 years, we have been providing Escambia and Santa Rosa counties with the best in power washing services. Our experienced house washing team is able to clean surfaces including siding, decks and more. House washing is also a great way to increase curb appeal, especially when you are trying to sell your home. Using a pressure washer is much more effective than using other traditional cleaning methods. The high pressure effectively removes tough dirt and debris. Pressure washers can be used to clean siding, decks and concrete walkways & driveways. This is a perfect technique to use when you have to do some serious house washing! 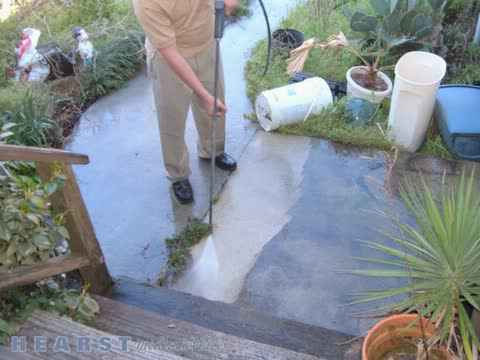 Often times, homeowners underestimate the outcome of power washing their home. If you are going to put your house on the market, investing in professional power washing services can make your house look cleaner and newer. For a small amount of money, you can increase the resale value of your home by using power washing when you are doing house washing. As a family-owned business, we have the outstanding ability to guarantee excellence and top quality control. With our experience and thousands served in the area, we have nothing short of excellence to show for our work. We handle both residential and commercial properties with the same quality service. You are guaranteed to be impressed with a job well done. Give us a call today for a free quote on our house washing services! We also offer pressure cleaning services to Pensacola, FL. For a lot of homeowners, their home is their largest investment. Upkeep and maintenance is the best way to ensure your investment does not lose value. Cleaning and maintaining the exterior of your home can be as important as repairing and remodeling. We use high-quality pressure cleaning to professionally clean the exterior of your home. Riley's Housewashing is the most experienced house washing company in the Pensacola, FL area providing fast, efficient, and affordable residential cleaning services! If you care about the way your property looks, we have the right solution for you! You can trust our years of experience to produce results that amaze – on time and on budget. Our exterior cleaning services include house washing, pool decking, backyard patios, concrete, decks, fences, stone, brick, roofs, windows and more. The exterior of your home is visible to everyone that drives by. Keeping your home clean is an important part of maintaining your home. Pressure cleaning your house will also improve your home's curb appeal. Tough dirt can build up quickly on the outside of your home. Leave it to our experts to remove it without damaging your home by using the pressure cleaning technique. If it needs cleaning, we’ll make it look like new. Pressure cleaning will add years to the exterior of your home by removing dirt, debris and other harmful pollutants from the surface of your home. We combine state of the art equipment and treatments with traditional hard work for the best outcome. Both high pressure and low-pressure cleaning methods are used to effectively clean, without damaging any of your property. We clean any exterior surface that will allow it. Some home examples are windows of almost any type, siding, gutters, roofs, and more. We also take care of driveways, pool decks and patios, sidewalks, porches, patios, fences, and the list keeps on going. If you aren’t sure if it should be pressure cleaned, give us a call and we’ll check it out for you. Pressure washing is the application of high-pressure water spray to clean and restore. The machine uses specially designed pumps, the spray from the machine is more than hundred times more powerful than the typical garden hose. It is used to remove unsightly mold, bubble gum, and other dirt stains from various surfaces. Pressure washing is one of the best ways to clean your home. Pressure washing uses water pressure to blast the dirt off surfaces. If the exterior of your home is starting to look dirty, let us clean it with power! Wooden decks are returned to the look of new wood, void of graying and fatigued finishes. And on houses, the appearance of siding (namely aluminum and vinyl) can look new again by removing pollution, mildew, and other signs of neglect. Pressure washing is the most effective way to renew your home. Call our Pensacola, FL office today for more information! Riley's Housewashing offers a variety of pressure washing and cleaning services. Both high pressure and low pressure cleaning methods are used to effectively clean, without damaging any of your property. Pressure cleaning is the best way to clean the exterior of your home or business.